Hi. I'm trying to figure out how to attach either a foil balloon or 36" round latex balloon on top of a column. Take an uninflated 260Q balloon, find the middle of it and tie it to the neck of your large latex or mylar balloon. Next, tie the ends of the 260Q together to form a rubber band. Now place the topper balloon on the top of the column and pull the 260Q rubber band down about three or four of your quadruples and pop it over the balloon clusters. The tension creates a nice tight column and holds the top balloon securely. Alternatively, you can leave the ends of the 260Q balloon loose, and weave them around the clusters to secure the topper, as shown in the video below. Finally, if you want to make it easy for you, you could get yourself a so-called balloon column topper cap. It's a device specifically created to attach topper balloons (both latex and mylar) to a pole. However, it won't fit any pole. The diameter of the pole should be 7/8". Hope that helps! 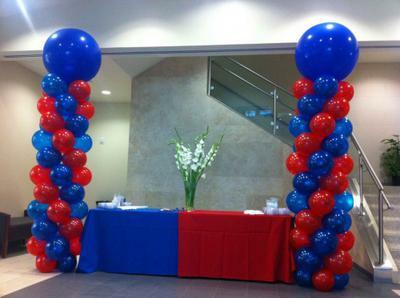 Would love to see a photo of your balloon column. You can either submit it here, to my Photo Gallery, or to my Facebook Page. I don't really know what you mean with your question. Can you perhaps re-submit it to my FAQ Page? There you can upload an image with a design that you'd like to make. Then I can help you better. I have seen plenty cutouts of pictures of names for centerpieces. What is used to cut them out and what are they made of?